In this week’s Torah portion we read the following concerning the construction of the table of the presence in Shemot / Exodus 37:10-16, וַיַּ֥עַשׂ אֶת־הַשֻּׁלְחָ֖ן עֲצֵ֣י שִׁטִּ֑ים אַמָּתַ֤יִם אָרְכּוֹ֙ וְאַמָּ֣ה רָחְבּ֔וֹ וְאַמָּ֥ה וָחֵ֖צִי קֹמָתֽוֹ׃ 37:10 He made the table of acacia wood, two cubits long, one cubit wide, and a cubit and a half high; וַיְצַ֥ף אֹת֖וֹ זָהָ֣ב טָה֑וֹר וַיַּ֥עַשׂ ל֛וֹ זֵ֥ר זָהָ֖ב סָבִֽיב׃ 37:11 he overlaid it with pure gold and made a gold molding around it. וַיַּ֨עַשׂ ל֥וֹ מִסְגֶּ֛רֶת טֹ֖פַח סָבִ֑יב וַיַּ֧עַשׂ זֵר־זָהָ֛ב לְמִסְגַּרְתּ֖וֹ סָבִֽיב׃ 37:12 He made a rim of a hand’s breadth around it and made a gold molding for its rim round about. וַיִּצֹ֣ק ל֔וֹ אַרְבַּ֖ע טַבְּעֹ֣ת זָהָ֑ב וַיִּתֵּן֙ אֶת־הַטַּבָּעֹ֔ת עַ֚ל אַרְבַּ֣ע הַפֵּאֹ֔ת אֲשֶׁ֖ר לְאַרְבַּ֥ע רַגְלָֽיו׃ 37:13 He cast four gold rings for it and attached the rings to the four corners at its four legs. לְעֻמַּת֙ הַמִּסְגֶּ֔רֶת הָי֖וּ הַטַּבָּעֹ֑ת בָּתִּים֙ לַבַּדִּ֔ים לָשֵׂ֖את אֶת־הַשֻּׁלְחָֽן׃ 37:14 The rings were next to the rim, as holders for the poles to carry the table. וַיַּ֤עַשׂ אֶת־הַבַּדִּים֙ עֲצֵ֣י שִׁטִּ֔ים וַיְצַ֥ף אֹתָ֖ם זָהָ֑ב לָשֵׂ֖את אֶת־הַשֻּׁלְחָֽן׃ 37:15 He made the poles of acacia wood for carrying the table, and overlaid them with gold. וַיַּ֜עַשׂ אֶֽת־הַכֵּלִ֣ים ׀ אֲשֶׁ֣ר עַל־הַשֻּׁלְחָ֗ן אֶת־קְעָרֹתָ֤יו וְאֶת־כַּפֹּתָיו֙ וְאֵת֙ מְנַקִּיֹּתָ֔יו וְאֶת־הַקְּשָׂוֺ֔ת אֲשֶׁ֥ר יֻסַּ֖ךְ בָּהֵ֑ן זָהָ֖ב טָהֽוֹר׃ (פ) 37:16 The utensils that were to be upon the table—its bowls, ladles, jugs, and jars with which to offer libations—he made of pure gold. The bread of the Presence (לחם הפנים) was bread that was to be always present on a table in the tabernacle (and later in the temple). Vayikra / Leviticus 24:5-7 describes this bread as follows, “You shall take fine flour and bake twelve loaves from it; two tenths of an ephah shall be in each loaf. And you shall set them in two piles, six in a pile, on the table of pure gold before the Lord. And you shall put pure frankincense on each pile, that it may go with the bread as a memorial portion as a food offering to the Lord.” In the Apostolic Writings, the author of the book of Hebrews 9:1-2, states the table of the bread of the Presence was one of the items in the first section of the tabernacle. Also included in that place was the Menorah which was to give light before the Lord There were twelve loaves representing the twelve tribes of Israel. It is important to note the significance of the bread of the Presence and the Menorah together in the Tabernacle and the Ministry of Yeshua the Messiah. One observation that may be made during Yeshua’s ministry, he fed the multitudes of people, using 5 loaves and then later using 7 loaves, which sums to 12 loaves. Note in Matthew 14, the feeding of the 5,000, led to collecting 12 baskets of food left over. In addition, we read the Apostle John wrote in John 1:4 In Him was life, and the life was the Light of men. 1:5 The Light shines in the darkness, and the darkness did not comprehend it. 1:6 There came a man sent from God, whose name was John. 1:7 He came as a witness, to testify about the Light, so that all might believe through him. 1:8 He was not the Light, but he came to testify about the Light. 1:9 There was the true Light which, coming into the world, enlightens every man. (NASB) What is the significance of these observations? If we consider the greater context, in Matthew 4 we read of the deceiver (Satan) wanting Yeshua to make bread for himself to eat in order to satisfy his hunger. In Matthew 7 Yeshua states that a loving father does not give his children stones when they ask for bread. So we make the connection that Satan wants Yeshua to bypass the complete and total dependence upon the Father and usurp authority, rather than have it granted him. Yeshua would have bread, spiritually and physically, but not from his own exercise of the power that was given him, rather, he eats based upon what our Father in heaven has granted him. In Matthew 9-12, Yeshua has extended the metaphor of a grain harvest to his ministry. He then speaks of the parable of the sower and then of the parable of the leaven. Finally, in Matthew 14, we read of the feeding of the 5,000, with 12 baskets left over. In Matthew 15, we are given the feeding of the 4,000 with 7 baskets left over. Finally, in Matthew 16 the disciples worried about not having bread to eat and Yeshua explains that the previous bread miracles are not really about bread and warns them against the “leaven” of the scribes and Pharisees, which is a reference to their teaching. The significance of these observations is for drawing us back into the Torah context and the way of life God has provided for His people. 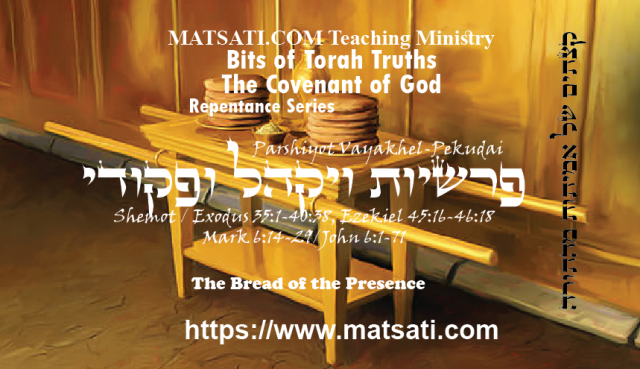 These examples on the use of bread draw us back to the Torah context in relation to the manna as well as to the Tabernacle that may be found in the table of the presence and the bread of the presence. What we are being taught here is in relation to leaven (sin), where the temptation is to circumvent what the Lord has for us in His Word. On a simple level the symbolism of the bread and the extra baskets of bread is that we are to seek the right / correct teaching, the teaching that corresponds to the word of God, regardless of the immediate circumstances. Having done so we will find an abundance left over because the Lord God is a gracious provider. The bread and the Menorah illustrate for us the messianic nature of the Menorah for light and the bread for life, that will guide those people who are walking in darkness to walk in the light of living upon the Word of God. Yeshua is the source of light having illustrated for us how to walk in God’s Ways where the Lord tells us through Paul that we are being conformed unto the likeness of the Messiah. Yeshua became the mediatory of the covenant so that those who believe and put what they believe into practice may receive the promised eternal inheritance. The question is, do you want the inheritance God wants for you and are you willing to accept all of God’s Word for that purpose? What Existed before the Universe?